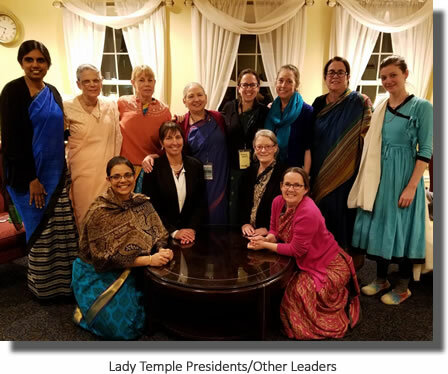 Dandavats | The 2019 North American Temple President’s Meeting was a grand success! 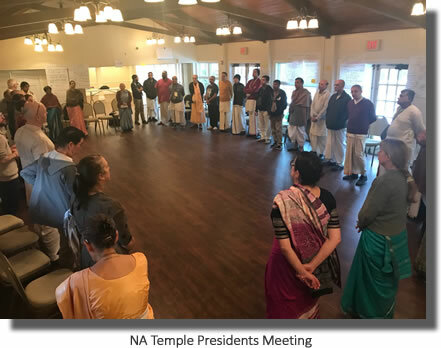 Thirty-nine Temple presidents including 4 GBCs and Support Office leaders met in a perfect facility just down the road from the Potomac Temple. Rockwood Manor was warm and cozy providing big meeting rooms, a nice prasadam room and serving area, and comfortable private and double occupancy rooms within the facility Even with the cold weather, it was sunny and afternoon break walks encouraged intimate conversations and healthy fresh air. We were completely supported by our Relax Team (TSI devotees/graduates Bhavin, Ratish, Arvind, Mohan Krishna, and amazing chef Chaitanya Mahaprabhu) who cooked three healthy satisfying meals a day, catered to special diets, and served with a smile and an enthusiastic attitude. We were all very grateful to them and encouraged by their service attitude and interest in ISKCON management. We concentrated on how we wanted to work together, what resources we needed to better serve our temples and where to find them, and how we wanted the relationship between TPs and GBCs to look and feel. This took one of our days where each TP spoke to what was working, what they needed and how all of our own responsibilities and habits play into the relationship. 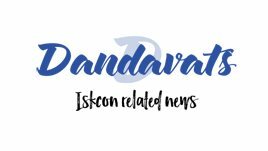 We spent one day envisioning TPs collective role in shaping ISKCON NA’s future; reflecting on the past year’s goals, and planning for this year. Many helpful tools and concepts were well discussed: what helps us live in the balance between critique and praise; more open communication; respect, partnerships outside our own communities; shared services/goals/vision; a common purpose. We were encouraged to get to know one another and in small groups we talked about a story of a time we deeply felt the presence of Krishna in our life; what we learned about our self from that, what we- the small group- learned about the storyteller. We spent a good deal of time looking at proposals (brought up by our TPs) that we’d like to see enacted this year, and real ways to make this happen using collaboration and communication tools. We gave thought to Succession, discussing what was needed and what we could be doing to get to where we need to be: more trained managers and opportunities for next generations. We also broke into small regional groups of not more than six and met separately with representatives from the NA Support offices: Youth Ministry, CPO, Deity ministry, Compliance Office, Book distribution, and the Sexual Harassment/Pastoral Abuse office. This interchange of information and Q and A was powerful in helping the TPs talk about what they needed in support, and what they can give to help support these important offices. Formation of a NA TP council made of one TP rep from each of six regions from the US and Canada. This council will interface with the NA GBCs quarterly, and meet with each other to create the agenda, take advantage of peer association to talk about successes and problems, as well as help each other support the NA initiatives. A NA TP Web portal that would contain access to all the Support offices mentioned above as well as new GBC resolutions, contact for all NA TPs, links to all NA temple websites. Here temples can pay their dues, see updates from the offices, find out how to reach compliance when necessary; we can share ideas and information. The goal is to make it easy for TPs to get knowledge and resources and fulfill obligations. We voted to identify an Ombuds for NA to handle conflicts in our region and to deal with leadership and other general training. There was some discussion on creating a Fund it Now department, not quite fleshed out yet, and a Read to Lead program, which will be linked on the Web portal. 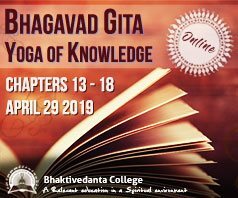 There was enthusiasm around Systematic Education programs that included a big inventory of many trainings already being offered, as well as programs that were wanted such as : Krishna House ashram training, Sunday schools, KC 101, online courses, and many more. Solutions and next steps were talked about and those interested will create a group themselves to follow up this year. There was a strongly interested group around GBC/Guru/TP communication that delineated the Issues and several Proposals. These devotees will follow up with each other throughout the year, and work through the TP Council. The Youth Ministry led by Manorama dasa garnered a huge amount of support. Manorama’s proposed Gap Year program will gain legs this year for sure, with several temples agreeing to work with him for hosting and fleshing out the offerings. Deva Madhava das from Ypsilanti will work on creating a Next Gen Council made up of representatives and graduates of existing youth sangas. This will develop training, inspiration, empowerment, engagement, education and internships for ISKCON youth. There was still more on the table and the devotees felt full and satisfied at the end of the three days, enthusiastic to join together to work on these initiatives and create a better ‘job description’ of TP for generations to come.